The first impression: colourful! The second: fragile. The third: fascinating. What are we looking at? A glass bowl, found in a Roman-era grave near Zadar on Croatia’s Dalmatian Coast. Zadar is a very beautiful place and a very interesting one for many reasons. Its name has changed from Greek Iader via Roman Iadera and Early Croatian Jadra, then Zadra, to Venetian/Italian Zara and finally modern Zadar. The town’s long and rich history is represented by a series of fine monuments, including an extraordinary ninth century circular church combining Byzantine and Carolingian influences, and an impressive system of Venetian city walls. 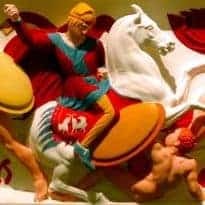 Zadar’s past is also presented in no less than two superb archaeological exhibits, one at the Archaeological Museum, the other at the Museum of Ancient Glass. A Museum of Ancient Glass? 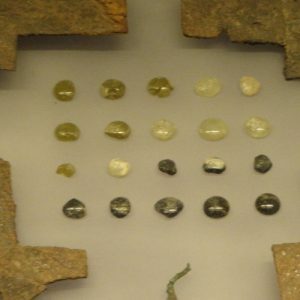 Indeed: the excavations at various Roman cemeteries in an around Zadar revealed such rich amounts of glass objects that they were considered to merit their own museum, founded in 2006. Set in the beautiful Cosmacendi Palace, a 19th century mansion, it is quite a large museum. There are well-lit and competently-labelled exhibits explaining the chemistry of glass-making and its history and technical development from prehistory to the Roman era (and beyond). Many galleries showcase specimens of glass objects from the Zadar excavations, focusing on different techniques and on the sheer beauty of the artefacts. A special highlight is the glass-blowing workshop, where demonstrations of the ancient methods take place several times per day. Our chosen object today is a sample of decorative Roman glass production from the first century AD. This was a transitional period for the art of glass-making. But let’s go back a little further first. Glass-making was invented in Mesopotamia before 2,000 BC, when it was discovered that melted silica (sand), natron and lime could form a new kind of material. This material, with its unique properties of transparency and of being able to take various shapes, developed a fascination early on and was thus traded as a high-value commodity. Glass vessels only began to be made around 1,500 BC, first in Mesopotamia, the Levant and Egypt, later also in the Aegean and Southern Italy. For fifteen centuries, all glass vessels were mould-made and came from a fairly limited number of production centres. But back to the first century BC: During that time, two major innovations changed the role of glass: the art of glass-blowing, which began in or around Jerusalem before 50 BC, and the invention of high-temperature and high-volume furnaces around the same time. They led to a rapid proliferation of glass workshops throughout the Roman Empire. Glass objects, hitherto expensive and fairly rare, became much more affordable and much more widespread from now on. Our bowl belongs to that era of proliferation and innovation, but it is still mould-made. The delightfully multi-coloured effect was achieved as follows. First, the workshop produced (in a mould) a series of glass bars in various colours, created by adding various minerals, in our case most likely various mixtures of copper, lead and antimony. Sometimes, several bars were then reheated (to soften them) and combined with one another, producing a striped effect, or wound into another, producing the swirl effects visible in parts of the bowl. Eventually, a series of such coloured glass bars, perhaps first combined into a disk, was heated/softened once more, then placed in a two-piece (clay) mould and allowed to cool. After cooling, the hardened bowl still had to be fine-tuned by cutting off surplus material and by polishing its surfaces. That, in short, is how polychrome bowls such as the Zadar one were made. While we understand quite well how the polychrome bowl at Zadar was made, there are other questions we cannot answer so easily. It is not clear, for example, that the object was really made locally (thus my title is a multi-coloured herring): the local workshops appear to have been specialised in monochrome blown glass, so the bowl could also be an import. Its function is similarly unclear: was it a treasured object used during the life of the deceased (if so, used for what? 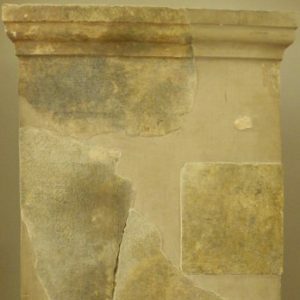 ), or – less likely – was it acquired especially as a grave gift? One way or the other, items like our bowl were clearly desirable for aesthetic reasons rather than practical ones – glass is fragile (if you look closely, you can see that the bowl had broken and was reassembled by conservators after excavation) and has no practical advantage over other materials: it is pretty. Curious: two mould-blown glass flasks shaped like dates. We also know that such objects were very popular at the time, as glass became more available across wider sections of society. It was an era of experimentation, not just with colours, but also with shapes and techniques. Much of this is visible in Zadar’s Museum of Ancient Glass: glass urns containing the ashes of the deceased, more or less ambitious blown-glass jugs, flasks and bottles in various colours, glass beads and jewellery, and quaint objects such as mould-blown containers in the shapes of fish or fruit… It is a wonderful collection that goes a long way to explain why glass has been such a fascinating material for such a long time. 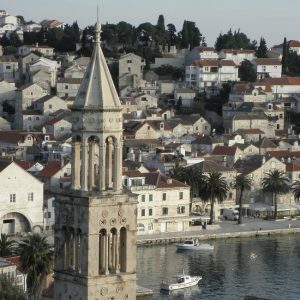 On Peter Sommer Travels’ Cruising the Dalmatian Coast: from Šibenik to Zadar, we show you the museum and its fascinating contents. The experience is part of one the best-prepared tours available in Northern Dalmatia, led by experts.